Automated duplicators are high volume optical media recorders that minimize user operation through robotic loading mechanisms. These high capacity disc burners operate as standalone machines without needing to be tethered to a computer. You can purchase models that work for CD/DVD or Blu-ray burning with backward compatibility. They do not offer direct disc printing capabilities so they are not a type of disc publisher. Automated duplicators are great because they offer hands free duplication and allow you to do other tasks in the meantime. Non-automated models require a person to load and unload stacks of discs between burn cycles and it can become a big drain on time and resources. The robotic arm does this job for you. The only task that is required is to load the stack of blank recordable discs into the machine’s input bin. The duplication sequence is controlled by the control panel. Finalized burned copies are transferred by the robotic arm and neatly stacked in an output bin for a person to retrieve. 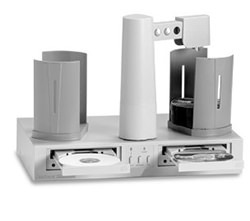 Automated duplicators are available with a capacity from anywhere between 25 to 1,800 discs. DVDs and Blu-rays, due to their larger capacity, will take longer than CDs to burn. Duplicators with more drives (four, six, or eight, for example) provide the greatest efficiency since you can burn multiple batches at once. Because they do not include printers, automated duplicators are significantly cheaper than disc publishers. Automated duplicators therefore yield big savings in both time and labor costs while still providing high capacity output.